The religious holiday of Passover is around the corner and the Rutgers Chabad House is a flurry of activity as students and Rabbis alike prepare to celebrate the holiday commemorating the Jewish Exodus from Egypt. To help prepare the Rutgers student body for the holiday, Chabad has begun an extensive Matzah Campaign. As per previous years, the programming provided through Chabad aims to provide students with information about the holiday of Passover and to provide matzah so that students will be able to celebrate Passover. This year, two student volunteers, freshman Esther S. and sophomore Effy Gittler partnered with Rabbi Shaya to make the program a success. Gittler set up and ran the annual matzah factory activities while Esther gathered volunteers to package and distribute matzah to the Rutgers student body. The 5774 Matzah Campaign sprinted into action last Tuesday night where Rutgers Chabad’s weekly J-Café was converted into a matzah factory. Gittler, along with Rabbi Goodman, taught students reasons for eating matzah on Passover. Then, Rabbi Goodman, with the help of student volunteers, guided students in the process of making matzah by hand. During the holiday of Passover, it is forbidden to eat anything that contains leavened bread; these items are known as chametz. In order to prevent matzah, unleavened bread, from becoming chametz, it must be made quickly and carefully watched in an eighteen-minute timeframe. After a lesson in the art of matzah baking, students were invited to make their own matzah, in less than eighteen minutes. While the matzah made by the students on Tuesday night was not kosher for Passover, all students were told when and where they would be able to find matzah for the holiday. The matzah factory was followed by an intense matzah packing and delivery campaign. The objective this Passover is to ensure that all Jewish students at Rutgers have access to matzah so that they may celebrate Passover. When asked why they are participating in the matzah delivery campaign, numerous students echoed the same sentiments as the Chabad Dorm’s resident assistant Ben Hutt, “The matzah factory was a way to learn about Passover and matzah. It also gave me an opportunity to help give others the opportunity to celebrate such a fun holiday!" 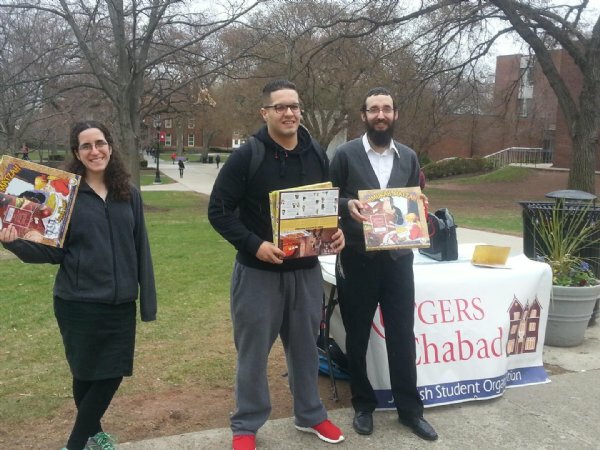 Currently, dozens of students may be found throughout Rutgers campuses giving out matzah to all students who are interested in celebrating Passover. The best part about giving out Matzah to students throughout Rutgers was “reaching out to students who either had little to no background in the holiday of Passover. Students were happy when we approached and talked to them; it was rewarding to see the impact we had on student,” said Esther. Students who have classmates and professors that are Jewish are encouraged to pick up boxes of shmurah matzah (hand baked with special flour that was under supervision from the time of harvest to present, to insure that it would not come in contact with water) at the Chabad House on their behest. The Matzah Campaign will continue full blast throughout Passover. All Rutgers students and affiliated members are welcomed and strongly encouraged to join Chabad throughout Passover. Chabad will be providing free Passover Seders both Monday night 14th and Tuesday night 15th. In addition, the Chabad Kosher Meal Plan will be serving an all-Passover approved menu throughout the eight days and nights of Passover.